Ph.D.: Computer Science, 2015 the University of Reading and the University of Babylon - the United Kingdom and Iraq Emphasis on Cloud Computing Recipient of research scholarship to work six months on my dissertation in the School of System Engineering, University of Reading in the United Kingdom under the supervision of professor Dr.William Harwin and Dr.Gary Smith. Coursework includes advanced networks, Cloud Computing, Data Mining, research studies and academic writing, Intelligent Data analysis, Wireless sensors, Java programming.
? Master of Science: Computer Science, 2006 University of Technology - Baghdad, Baghdad Governorate, Iraq. Coursework includes Data Security Networks, Security, Information Hiding, Advanced AI and Statistics.
? 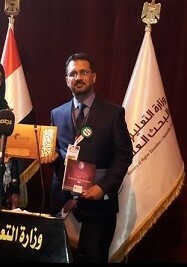 Higher Diploma: Computer science, 2004 Informatics Institute for Postgraduate Studies, ICCI- Baghdad, Iraq.
? Bachelor of Science: Computer Science, 2002 University of Babylon-Computer Science Department, Iraq with second rank of all class students. Work History Senior Lecturer Computer Science, 05/2012 to Current College of Information Technology University of Babylon – Hilla, Babylon ? Teaching Experience Teaching Cloud Computing for postgraduate students which include advanced topic about Virtualizations and IOT with cloud. Course is available only on local Moodle. ? Teaching Sensors, Arduino, Raspberry and cloud IOT platform like thingspeak.com for undergraduate students.
? Taught introductory and upper level courses in windows server. Undergraduate students. ? Taught introductory and upper level courses in Java Script. Undergraduate students. ? Taught introductory and upper level courses in C++. Undergraduate students. ? Taught introductory and upper level courses in Programing with VB.Net. Undergraduate students ?Other Learning Duties: ? PC Member & Managing Editor – CSASC-2012 Conference ? Establishment member of Babylon Online Journal ? Fostered students commitment to lifelong learning by connecting course materials to broader themes and current events. ? Served on two college committees and acted as chair of the E-learning Committee. Demonstrated a continued commitment to undergraduate teaching through full participation in the college community. ? Developed and delivered engaging lectures to undergraduate and graduate students. Wrote course materials such as syllabi, homework assignments and handouts. ? Wrote, administered and graded midterm and final examinations. ? Planned, evaluated and revised course content and course materials. ? Supervised and evaluated students laboratory work. Guided students in using technology to support educational research. Coached students on public speaking and presentation skills. Teaching Experience ? Object Oriented Programming (30 hours), course organizer and lecturer. ? Taught introductory and upper level courses in Software Engineering (30 hours), course organizer and lecturer. ? Taught introductory and upper level courses in Numerical Analysis. ? Taught introductory and upper level courses in Excel, Word, Access, PowerPoint, and Publisher. Coached students on public speaking and presentation skills. Guided students in using technology to support educational research. ? Skills ? Mature computer specialist with strong technical and analytical skills. ? Able to learn new things quickly, train staffs effectively, meet deadlines promptly, and help people who don t understand IT. ? Detail oriented, with sound business sense and logic; excited about new opportunities to learn and grow professionally. ? Keen interest and extensive experience in a wide variety of computer operating systems, computer programming, applications and hardware. 1-Ad-Hoc PhD Program, School of Systems Engineering, University of Reading, 30 Sept 2013 to 31 March- 2014. 2-Writing for Research Articles, Seven and half day, International Studies and languages Institutes University of Reading, Reading,UK,17-15 December 2014. 3-Fulbright Scholarship Program, Fulbright Foreign Scholarship Board, Washington, DC, USA, 7-15 Sep-2012. 4-Computer Lab Training two workshops credits Hours, Research and Sponsored Programs, Kent State University, Ohio, USA, 10-Jul-2012. 5-Peer Review Process Training One workshop credits Hour, Department of Geology, Kent State University, Ohio, USA, 4-Sep-2012. 6-Reopening, Tenure and promotion Process at Kent state University, two and half workshop credits hours, College of Arts and Science, Kent State University, Ohio, USA, 28-8-2012. 6-Technology in the Classroom: Using Clickers, One and half workshop credits hours, Faculty and Professional Development Center, Kent State University, Ohio, USA, 23-Aug2012. 7-Science Lab Orientation, One Workshop credit hour, Research and Sponsored Programs, Kent State University, Ohio, USA,12-Jul-2012. 8-Library Orientation for Kent State University Library, One and One half Workshop credit hours. University Libraries, Kent State University, Ohio, USA, 10-Jul-2012. 10-Technology in the Classroom, Part I and Part II three and half workshop credits hours,Faculty and Professional Development Center, Kent State University, Ohio, USA, 30-Jul2012. 11-ITP- TOEFL with 502 Scores, AMIDEAST, Al Jadiryah Baghdad, Jan 2012. 14- Cisco Certificate (CCNA Exploration: Network Fundamentals), Cisco Academy, University of Babylon, 24-Oct-2009. 16-Educational Advisor, Baghdad 2st Workshop, Academic for Educational Development www.aed.org 2010. 17-English Certificate for the higher Education, Babylon University, English Test Center 2002. 14thanks letter from the President of the University for my Efforts in developing the Learning using technology in my university. Publications ? Toward Trust and More Characters of Arabic Short Message Service using Encryption AK Hadi Journal of Engineering and Applied Sciences, 2017 [Scopus, Q3] ? Building the Primes P&Q (Of the Public Key Algorithm) by Using Function of Reals F Al_Mamory, AK Hadi, ALS Ahmed - Research Journal of Applied Sciences, 2016.[Scoups,Q4] ? Collaborative Computer Aid Diagnosis Framework In Cloud Environment Based On Multi Agents Systems, Al-Bakry, Abbas M; Hadi, Ameer Kadhim. International Journal of Advances in Engineering & Technology; Bareilly Vol. 7, Iss. 1, (Mar 2014): 21-29.